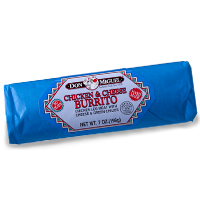 The DON MIGUEL® Chicken & Cheese Burrito packs 7 ounces of savory chicken leg meat, three kinds of real shredded cheese and mild green chilis into a hearty, handmade flour burrito. 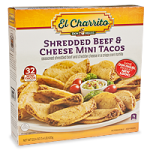 To top it all off, we hand butcher wrap each one to seal in their flavor and freshness. 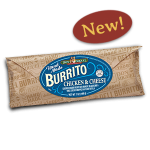 The perfect on-the-go dinner or sit-down lunch, DON MIGUEL® Chicken & Cheese Burritos can be found at your local convenience or grocery store deli. 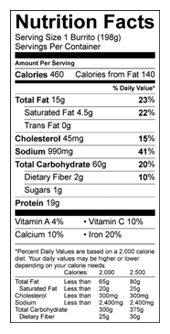 Bleached wheat flour enriched (niacin, reduced iron, thiamine mononitrate, riboflavin, folic acid), water, soybean oil, contains 2% or less of: salt, baking powder (corn starch, sodium bicarbonate, sodium aluminum sulfate, monocalcium phosphate), emulsifiers (guar gum, mono & diglycerides, rice flour), guar gum, sodium metabisulfite. Dark meat chicken, green chiles, green bell peppers, water, starch slurry (water, modified food starch), contains 2% or less of: tomato paste, chicken broth flavor mix (hydrolyzed corn gluten, soy protein and wheat gluten, salt, sugar, autolyzed yeast extract, dried chicken meat, torula yeast, soy flour), vinegar, jalapeño peppers, flavorings, dehydrated green bell peppers, salt, acetic acid, calcium chloride. Water, pasteurized process American cheese (American cheeses [milk, cheese culture, salt, enzymes], water, milkfat, sodium citrate, salt, sodium phosphates, color [annatto and apocarotenal]), Cheddar cheese (pasteurized milk, cheese culture, salt, enzymes, annatto), Monterey Jack cheese (pasteurized milk, cheese culture, salt, enzymes), modified food starch, vinegar.